I cooked this Chicken and Mushroom Rice last weekend. Weekends are the best time for a cookout. I figured food actually taste better when you’re not in a hurry to get food on the table or extremely hungry after a long day at work. One Pot Casserole dishes are easy to whip up because they usually only utilize one pot as the name states. It’s a very efficient way to cook food with minimal washing ( A wish for all home cooks). For this very purpose, I brought out my new red Le Creuset pot which I received for my birthday last year. It was quite a big pot ( 26cm). I contemplated cooking a smaller amount to fit my 22cm pot but figured it’s better to have more than less. The steps are pretty self-explanatory and the best part is you get to dump all your lovely ingredients into the pot and watch it magically cook in the oven. 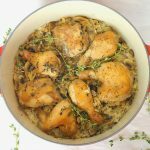 45 mins is all you need to wait ( while you do your daily activities) and you get to sit down and enjoy a plate of fragrant rice mix with all the yummy juices of the marinated chicken, thyme, mushroom and stock. 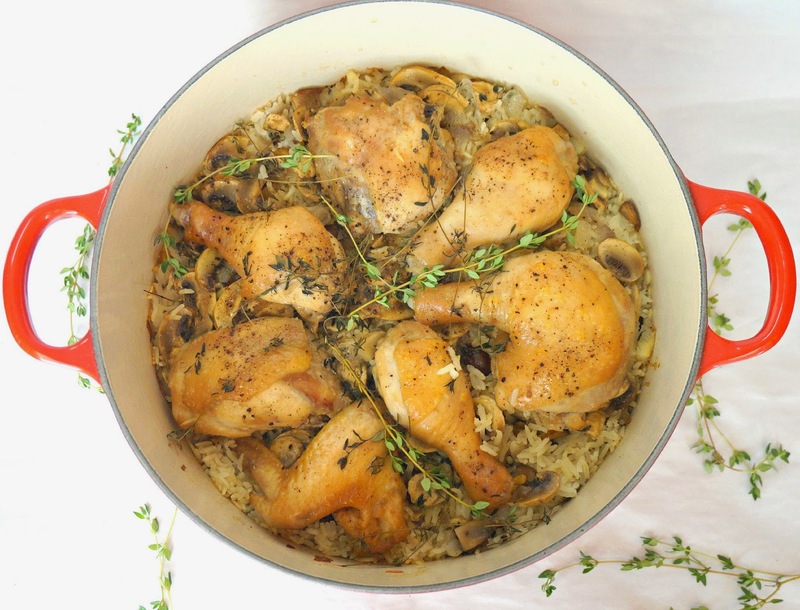 This Chicken and Mushroom rice is so delicious. I’m contemplating making this again this Thanksgiving. Marinate chicken thighs and breasts with honey & light soy sauce. Brown chicken for a few min on both sides in a pan. Remove from pan and set aside. Heat butter in cast iron pot. Fry onion till browned and translucent. Add rice. Stir to mix in with onion. Add chestnuts, mushrooms and chicken stock. Bring to a simmer. Place chicken thighs and breasts on top of rice, pressing down to level with rice. Drizzle 2 tbsp honey onto chicken. Sprinkle with thyme and black pepper.